The Egyptian news website Mada Masr, which has courageously delivered independent, investigative coverage to a public otherwise starved of it, is the recipient of the 2019 Free Media Pioneer Award. The annual Free Media Pioneer Award was established by the International Press Institute (IPI) in 1996 to recognize news or media organizations that have made innovations that have promoted news access or quality, or benefited journalists and the media community, thereby ensuring freer and more independent media in their country or region. For the past four years, the award has been given in partnership with Copenhagen-based International Media Support (IMS). This year’s Free Media Pioneer Award will be presented together with IPI’s 2019 World Press Freedom Hero Award during a special ceremony on June 5, 2019, in Geneva, Switzerland, during IPI’s annual World Congress and General Assembly. Mada Masr was launched in June 2013 at a time of sweeping crackdown on dissent. Now in its sixth year of operations, Mada Masr is a rare beacon of freedom in Egypt’s restrictive information landscape. Against the odds, the site continues to challenge the narratives espoused by Egypt’s predominately state-controlled media, providing fearless coverage of taboo topics. Its refusal to bow to censorship has incurred official wrath. In 2017, the site was one of nearly two dozen critical outlets blocked by the Egyptian government for “spreading lies” and “supporting terrorism” – accusations the authorities routinely level against critical voices. Mada Masr remains primarily accessible via VPN but has also sought to circumvent the block through mirror sites. The site was unique in launching a legal case against the 2017 website blockings. The case has since been referred for technical review to a panel of experts within the Justice Ministry. 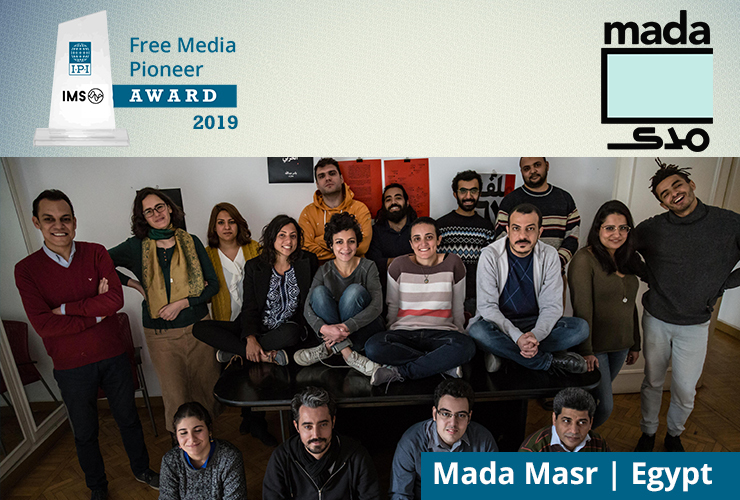 In a statement welcoming the Free Media Pioneer award, Mada Masr co-founder Lina Attalah, named a next generation leader by TIME magazine in 2017, reflected on the site’s vision. Mada Masr publishes in both Arabic and English. Supported in part through philanthropy, the site also offers a membership programme to readers wishing to support its independent coverage and “safeguard a space for critical knowledge production and free, creative expression”. Read more about how you can support Mada Masr here. IMS Executive Director Jesper Højberg said he was pleased to honour Mada Masr. IPI Executive Director Barbara Trionfi added her support to this year’s award recipient. The 2018 Free Media Pioneer Award was given to the Philippines-based news website Rappler in recognition of the site’s innovative approach to journalism and audience engagement as well as its determination to hold authorities accountable despite aggressive attacks on its operations. Previous winners have included Turkey’s Medyascope, Mexico’s Periodistas de a Pie and the Afghan Journalists Safety.